Sometimes Lord, when the wind blows and the skies crash, I’m afraid. Sometimes Lord when the world squeezes me to the point of bursting, I’m afraid. Sometimes when I allow my doubts to rise up in my mind, I’m afraid. I’m just being honest and open Lord. My heart hurts and I’m shaking Lord and I wonder if you see what I’m going through. Have you ever said any of these words? Have you cried out to God to give you help or to calm your fears? 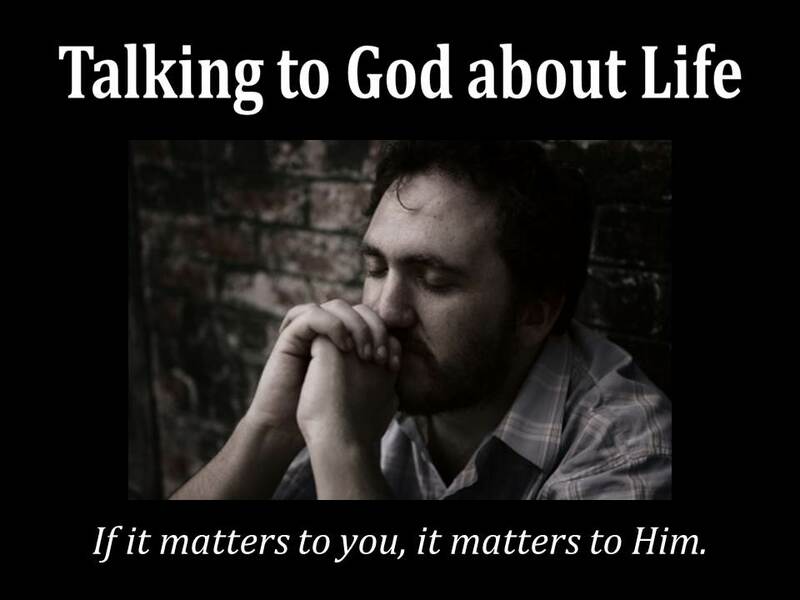 Have you ever wondered if God even cares? I can tell you this. I’ve said these words. I’ve cried out to God for help to the point of tears. I’ve wondered where God was. But I will also tell you this. God never left me. God was always close. God heard my cries. God moved into my situation. And God will do the same for you. It seems we place God into the form of a mortal man. We cry out in prayer to a God we believe exists, but we lower our expectations as if God was a man. As if God was limited or was unable to understand. And this leads us to believe nothing is possible. But I tell you that nothing is IMPOSSIBLE for God. God is not a man. God is a supreme being. He is the beginning and the end. The Alpha and the Omega. He created all things that were created. And He loved you before you were ever born so much that He sent His Son, Jesus to die for you. (John 3:16) Yes, for you! So that you could spend eternity with Him. Hello, it’s me God. It’s been a rough few days and I know I’ve been trying to figure this all out by myself. Again, I confess that I can’t. You see God it’s overwhelming at times. It seems that every day something new comes up and gets heaped upon my shoulders. The weight is getting unbearable. Yet, I think I’m superman or something. I know you didn’t create me to be superman or any other super hero. But I just seem to forget. You know those white boards that we keep in our offices to keep track of things that need to be accomplished. A visual “to do” list. Well, when I was thinking about all of this before bed a few nights ago, I saw an empty white board in my thoughts. And then all of a sudden the board was full. Like there was no more room to add a single thing. It was then I thought to myself, “That’s where I’m at.” Again, it overwhelmed me. I’m told God that You hear and answer every prayer. I’m told that You are faithful and that You are able. I’m told that You never leave my side and that You are my Rock, my Refuge, my Strong Tower. Well, God, I really need You. I’m at my end and I submit to You that I’m not able. I need You to get through the next moment in time even if it’s just the next second because I have no more strength. Help me God! Really, help me God! I have no more to say because I can’t put anything more into words. So I’m turning to my faith and my hope in You. Encourage me along the way because God I really need it.